I am going to be a bit eclectic in these next few blogs, probably jump around a bit. This one is mostly focused on a very important topic for those of us who have a Tibetan Buddhist teacher who speaks no English, as I do: translators. When I came on the scene there were two approaches to learning Tibetan Buddhism in North America, students who practice traditional texts in English and those who do it in Tibetan. Early on I had a brush with those who advocated English when I met the great siddha, the Ven. Chögyam Trungpa Rinpoche, but as it turned out, my own root lama turned out to be more conservative, the Ven. Khenpo Karthar Rinpoche, who had us do our dharma practice in Tibetan. Khenpo Rinpoche wanted to make sure that there were not any residual blessings to be obtained by reciting the Tibetan text, which had been around and chanted for a thousand years or so. Even the thought of practicing in Tibetan was challenging at first. Learning to read Tibetan was not a simple thing, and most students would recite their texts in transliteration, the phonetically-correct pronunciation of the Tibetan. I later learned to actually read Tibetan itself and translate very crudely, but always with a Tibetan-English dictionary or two on hand. Mostly what has remained with me is the transliteration. It is a lot easier. However, a great many of the words used in the Tibetan dharma texts are common to most sadhanas (practice texts), so after a while I knew the words, and even what many of them meant. Still I would have rather done the practices in English, given a choice, which I was not. Instead, I looked at the Tibetan script, read the transliteration, and tried to scan the English to know what I was reading. This is not exactly easy or relaxing. Sitting on the cushion and reading through my practice texts was one thing; listening for thirty years or so to direct dharma teachings quite another. Translators were not only essential; they became celebrated personalities in their own right. Just imagine: every word of the precious dharma (from your beloved teacher) comes out of the mouth (and mind) of an English-speaking person just like me, and in many cases much younger. In the very beginning, the translators I met were Tibetans who had learned English, some English, never quite enough of course. The net result was that whatever new English slang words the Tibetan translator was learning colored the particular teaching you were listening to. As the years passed, so did the English colloquialisms that were being tried out. I should know because I personally transcribed a great many teachings. I could almost tell what vintage the text was from what American slang turned up in them. My favorite translator and beloved friend was the Tibetan Ngodup Tsering Burkhar, who translated for my teacher the Ven. Khenpo Karthar Rinoche for over 12 years, many of them during the early period when centers were not very established. Both ngodup and Rinpoche would sleep on couches, floors, wherever there was space. Ngodup is the kind of person that when there was an emergency we could always call him in the middle of the night. He would never complain, but immediately get up and find Rinpoche for the answer to whatever questions we might have. If I have met a living bodhisattva in this life (who is not a rinpoche), it is Ngodup. I can never repay his kindness. And translators back then did everything. The carried bags, booked passage, served as Rinpoche's attendant, saw there was food, and on and on. They also translated of course, which is not as easy as it might sound. They are either listening, remembering, and trying to take notes for half the time, and translating and speaking the teaching to those gathered the other half. Rinpoche can speak for thirty or forty minutes at a time and the translator has to remember and translate the whole thing. Moreover, since Rinpoche does not speak English, there are innumerable interviews that can run day and night. Of course, at least back then, the translator translated all of those. And worse, many of the folks in attendance did not understand that the translator does not get paid except by offerings. They would offer to the rinpoche, but not to the translator. Americans have to be educated in what Asians understand so well, making offerings. Later came the first native English-speaking (English as a first language) translators, and in this regard our monastery (Karma Triyana Dharmachakra) was very, very lucky. I can well remember first meeting Lama Yeshe Gyamtso, who back then was still sometimes called Peter O'Hearn. This Canadian, who had also done two traditional 3-year closed dharma retreats, not only spoke fluent English, but had hands-on and deep personal experience with the dharma itself. I personally know of no finer translator in my experience than the brilliant Lama Yeshe Gyamtso. With the exception of the first two ten-day Mahamudra teachings at our monastery, Lama Yeshe has translated every single one and we are going into our 27th year. That is more than 260 days of morning and afternoon teachings. The transcriptions for the 10-day Mahamudra teachings fill a shelf about four-feet wide. They are just incredible teachings, and incredibly well translated. Years from now this dharma treasure will be available to the world in Tibetan and English. 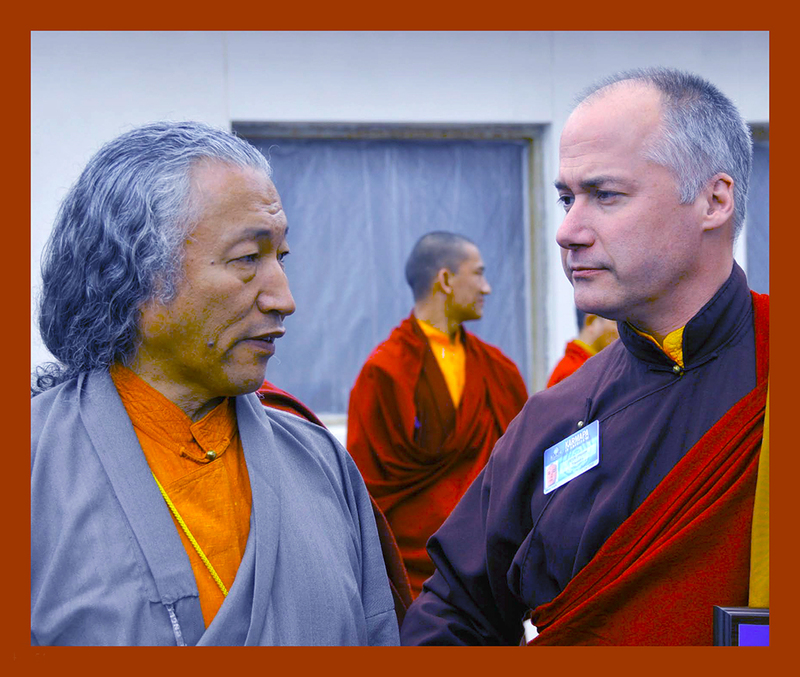 For many years Margaret and I were in charge of the transcription and publication of the 10-day Mahamudra intensives. When the first Tibetan rinpoches came to this land, they were on their own. Translators were in short supply. Next came a wave of young Tibetans who, with their not-so-bad English, filled that vacuum, and finally we are starting to have English-speaking North Americans who can translate Tibetan and who also know something about the dharma itself. Still, even this is just a stop-gap measure. There is something much more important we are waiting for. We are not just waiting for more or better translators, but rather for westerners enlightened enough to translate not the dharma from Tibetan, but just the dharma from their own enlightened minds. Of course, if they knew Tibetan it would help, but more important is that we have native English speakers who have managed to enlighten themselves. And from that enlightened state, whatever they write will be perfect dharma, written out in English and also nuanced from our cultural point of view. Then the circle will be complete. The dharma will live in North America, just as it did in Tibet. Language-wise, the dharma will have transmigrated. We will have our own North American Buddhist saints and great teachers. Just as Jesus was a Jew and Buddha was a Hindu. The dharma does not belong to one country or culture, but stands alone through whatever language and country it takes root in. North America will be no different.